Here is a list made in groups to help establishing what type of work would be considered a Siberian breeding program. 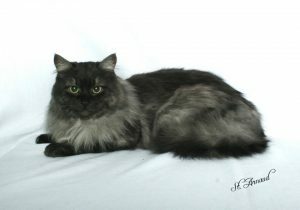 Above all, a Siberian breeder should be concerned about preserving the breed’s genetic pool and avoid any sort of mixing with colorpoint cats or other breeds. 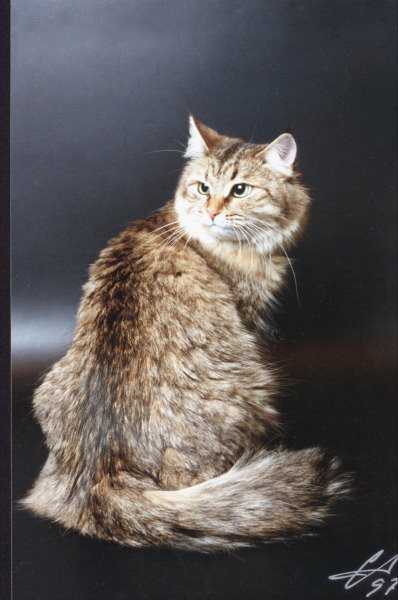 There is a lot of controversy regarding the colour point cats called “neva” originated by the mating between Siberians and colorpointed cats that could have happened either accidentally (considering Siberian cats were mostly farm cats, street cats etc) or from intentional man made matings. Either way what is important to know is that ”colorpoint” is not only a simple fur pattern and color variation. Along with colorpoint gene other characteristics that are typical to these cats will also be passed on to offspring. There will be a page talking about the matter but for now, you will find here the list of groups to help better understanding of how a Siberian breeder should work in order to preserve the breed’s genetic pool. Atention: These groups are in no way related to FIFe color groups. Breeding exclusively Siberian bloodlines free of cs carriers, which is rather uncommon. Cica Yaroslav Zhandarmovich, Group 1, courtesy of Maria Pavlovsky, Cica cattery USA. Explanation: This is uncommon because there are only a few lines available and sometimes (but not always) highly inbreed. Working only with these lines is not possible (see why on the text below). They are still very important rare cats that must be preserved and they are wonderful work tools. To belong to group 1 every cat present in the entire bloodline from foundation must be Sib (of course) and not carry colorpoint gene. A more relaxed modality would be breeding lines without any colorpoints in the genealogy (even if there are cs carriers somewhere). Explanation: These are bloodlines that are “neva free” because there aren’t colorpointed cats in the registered genealogy BUT there are cats that are known to be cp carriers.The fact that one or another cat is a cp carrier does not mean necessarily this cat’s ancestors have been mated with a Neva. It simply means that one ancestor encountered a colorpoint cat on its path and there was a mating. Kittens from the match could carry the gene and pass on. *extract from clean genealogy: Some may think that if there are cs carriers as well on these clean ped lines, at some point behind there had to be some colorpoint cat! Indeed, if we would be able to look back we may find a colorpoint cat here or there far behind. A colorpoint cat that would be definetly not a neva but something closer to any of the colorpoint original breeds. Even, we may not just find only a colorpoint but also many other even more undesired things for Siberians nowadays. The same goes for any other breed… if we are able to look far behind, what surprises could happen here or there? The point is that this past is irrelevant, it is impossible to take in consideration something that cannot be checked accurately and the important is to be consequent with the beginning of the breed we have on registered paper. Breeding the way most people do accepting the lines with Mars as foundation ( or other colorpoint in the foundation cats). 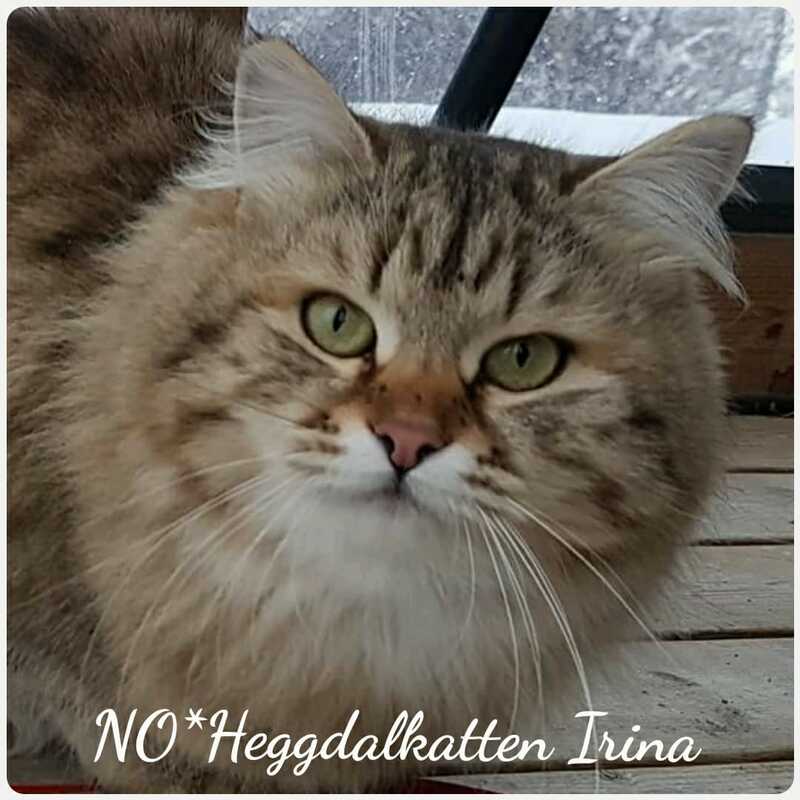 NO*Heggdalkatten Irina, Group 3, brown spotted tabby, courtesy from Elin Reggdal NO*Heggdalkatten Norway. Explanation: Cats that only have one Neva at foundation. Some of our best blooding lines have been built with these cats at foundation and these lines must also be preserved and kept in breeding programs. They are become as rare as a neva free Siberian group 1 or 2. I would like to mention here Nyusya who was a color pointed cat born in a farm. The owners killed all tabby litter mates keeping only Nyusia because of the different fur and blue eyes. Nyusia was born on the 90’s and was given a pedigree as a Neva. Number four would be those that do not have any problem with whole neva families in the pedigree. Any neva after foundation is considered to be a family. Explanation: There are very beautiful and good cats in group 4 but there are also those full of nem, entire nem families everywhere. With this group, comes a rather complex subject because group 4 is like an OPEN DOOR for mixing considering the most used argument for nem mixers is: “But this cat has already several nem in its genealogy, it doesn’t make any difference” group 4 is also an open door for even further mixes like happens on Germany nowadays Sib with other breeds aiming for new colors and patterns. Therefore, I say it is a question of common sense: You are a Siberian breeder, you own a cat group 4, it is up to you to decide if it’s genealogy is worth to be kept on Siberian genetic pool. Keeping this important fact in mind, you decide if it would be better to keep this cat as a pet maker or if it would be a loss for Siberian genetic pool to loose it. Obviously for future purchases of new Kings and Queens, the ideal is to search the entire genealogy of the cat and stick to groups 1,2 and 3. I also would like to say that the main concern is not about genetical expression only but about this open door for further mixing. It is also possible to test kittens and select according to all the usual important selection criteria including CP gene. The main concern is to keep the natural cat, the Siberian genetic pool SIBERIAN and as free as possible from any interference. Would be the neva breeders and mixers. Explanation: Neva breeders need good Siberian blood to retype their cats and they mix good Siberians lines with their neva cats. The results are a disaster and considering the majority of people want to have variety of “colors” and sell kittens without any research as well as those who chose to mix knowing the consequences for the breed, Siberian breeders are outnumbered by mixers and immediate action is need.A good responsible Siberian breeder will not sell kittens to mixers and avoid buying from those who don’t care and sell beautiful Siberian bloodlines to nem mixers. Would be a extreme of just nem x nem for the neva breeders. Which is totally fine and meet our goal considering these breeders also want the total separation of breeds, SIB and Neva being a different breed. WE NEED You who believe Siberians are great natural cats and want to preserve their genetic pool keeping them as close as possible to their natural state.